Each module is made from a single silicon crystal, and is more efficient, though more expensive, than the newer and cheaper polycrystalline and thin-film PV panel technologies. You can typically recognize them by their color which is typically black or iridescent blue. As the name implies this type of solar panel are unique in their use of a single, very pure crystal of silicon. Using a process, similar to making semi-conductors, the silicon dioxide of either quartzite gravel or crushed quartz is placed into an electric arc furnace. Heat is then applied and the result is carbon dioxide and molten silicon. This simple process yields silicon with one percent impurity, useful in many industries but not the solar cell industry, which requires a much higher purity level. This is accomplished by passing a rod of impure silicon through a heated zone several times in the same direction. This procedure "drags" the impurities toward one end with each pass. At a specific point, the silicon is deemed pure, and the impure end is removed. Next, a silicon seed crystal is put into a Czochralski growth apparatus, where it is dipped into melted polycrystalline silicon. The traditional way of adding boron, is to introduce a small amount of boron during the Czochralski process. The seed crystal rotates as it is withdrawn, forming a cylindrical ingot of very pure silicon. Wafers are then sliced out of the ingot, then sealed back to back and placed in a furnace to be heated to slightly below the melting point of silicon (1,410 degrees Celsius) in the presence of phosphorous gas. The phosphorous atoms "burrow" into the silicon, which is more porous because it is close to becoming a liquid. The temperature and time given to the process is carefully controlled to ensure a uniform junction of proper depth. Note: Solar cell plants are complex and large (typically 10-50MW capacity and over 5,000 sqm of plant area). A rule of thumb guide to the capital investment in building a solar cell plant is US$1M/MW for monocrystalline silicon. Crystalline-Si cell plants, based on well-proven technology, can be operational within 18 months to two years of project approval and could be running at full capacity after a further year. At a fully operational 50 MW Plant, around 300 jobs might be created, including operational, warehousing, fabrication and overhead administration. The actual number will be dependent on the chosen technology and degree of automation. Because of the high electrical requirements (for the electric arc furnace), such plants are typically located where electrical costs are low (how ironic is that !). Currently, SunPower (USA) manufacturers the most efficient monocrystalline solar panels - with an efficiency of 22.5 percent. In June 2010 they broke the world's record for commercially produced solar cells at 24.2%. According to various researchers, it is not theoretically possible to convert more than 29 percent of the light into energy using crystalline solar cells. Realistically, the limit for a PV panel is likely closer to 24 to 25 percent because of factors like heat, said Tom Werner, the CEO of SunPower, during a briefing with reporters in June 2010. Monocrystalline solar panels are first generation solar technology and have been around a long time, providing evidence of their durability and longevity. The technology, installation, performance issues are all understood. Several of the early modules installed in the 1970's are still producing electricity today. Single crystal panels have even withstood the rigors of space travel! Some other solar websites suggest that single crystalline solar panels can last up to 50 years. According to solar engineers I speak with even though this may be possible, there will be a slight drop off in efficiency of around 0.5% on average per year. So although this type of solar panels can last a long time, there will come a time when the lower efficiency makes it economically desirable to replace the panels especially as the efficiency of newer panels continues to increase. Note: Most performance warranties go for 25 years, but as long as the PV panel is kept clean it will continue to produce electricity. As already mentioned, PV panels made from monocrystalline solar cells are able to convert the highest amount of solar energy into electricity of any type of flat solar panel. Consequently, if your goal is to produce the most electricity from a specific area (e.g., on a roof) this type of panel should certainly be considered. Consequently, Monocrystalline panels are a great choice for urban settings or where space is limited. As a developer of PV rooftop installations in Germany, buying or leasing roof space is a significant cost of the whole project and so you want to be able to produce as much electricity you can from this valuable resource. The cost of solar panels is typically around 60% of the cost of a fully installed solar power system, with installation being a significant cost component. Although I haven't confirmed this yet, one installer in Australia (who sells and installs several types of solar panels) has said that some amorphous thin film panels actually need more mounting rails and take longer to install; adding to the overall cost of the system. Additionally, they reported instances where home owners have had to rip up all their thin film panels and sell those at a loss in order to boost the size of their solar power system when they switched over to monocrystalline solar cells to produce more electricity as their usage increased over the years. Note: With the coming of electric cars (many of which will be introduced in the next few years), several people in the industry predict the demand for high efficiency solar panels that can help recharge their electric cars is expected to increase. Even cars based on fuel cell technology such as the hydrogen car being developed by Honda could stimulate demand for more electricity to power a small pump station on the side of the house, creating hydrogen during the day which will be available as fuel for the car. In other words -- we can expect that many new technologies will be introduced in the coming years that will increase the demand for electricity … which will push up demand, and make it ever more desirable to be able to produce your own electricity -- so why not plan ahead and produce as much as you can from the space you allocate for this purpose. With the world rapidly moving towards renewable energy sources and with new developments in transportation, etc., we envision a time in the not-too-distant future where the type of solar array used; specifically the ability to scale up, will also factor into house price values. While thin-film solar panels offer a lower level of embedded energy per panel, the fact that more panels are needed somewhat negates this aspect, especially given the extra mounting rails sometimes needed. Embodied energy refers to the amount of energy required to manufacture and supply a product. Some thin film solar products uses cadmium telluride (CdTe) . Cadmium is a heavy metal that accumulates in plant and animal tissues. Cadmium is a 'probable carcinogen' in humans and animals. While cadmium telluride doesn't pose a threat while the panel is in service, disposal of this toxic waste when the product reaches the end of its life comes at large cost and suitable facilities which is why firms like First Solar offer their own "end of life" recycling program to take care of disposing this material. Monocrsytalline solar panels are not hazardous to the environment. Like other types of solar panels, monocrystalline solar modules suffer a reduction in output once the temperature from the sunlight reaches around fifty degrees Celsius/a hundred and fifteen degrees Fahrenheit. Reductions of between twelve and fifteen percent can be expected. This loss of efficiency is lower than what is typically experienced by owners of PV panels made from polycrystalline cells. Besides producing more electricity per sqm of installed panels, thereby improving your cash flow (from either a reduction in your electrical bill or from the sale of the electricity or in some areas both), for those who are "going green" and are concerned about the environmental impact of solar panels, monocrystalline panels reduce the amount of electricity needed from local power plants, reducing the dependence on fossil fuels. The greater benefit is a reduction in the use of limited fuel sources and greenhouse gases being pumped into the environment. A corollary of the durability and longevity of this type of solar panels is that in areas where there is an established track record of performance (e.g., in Germany), we are able to obtain bank financing of up to 90% for our projects, which is certainly a big reason why Germany has the largest installed base of solar panels in the world. Because PV panels made from single-cell silicon crystals the process of making them is one of the most complex and costly ones around. Good silicon feedstock is expensive (although less so in 2010 then it has been for a a while) and the cost of making a single pure crystal is time-comsuming and therefore costly, PV panels from monocrystalline solar cells generally cost more per panel than competing PV technologies. However, instead of comparing costs on a per panel basis, or even on a per kWp basis … I recommend you look at the investment on a per kWh basis over the expected life of the panel. Based on the analyses I've seen of various project proposals, monocrystalline solar panels are typically the most economical over the life of the installation. You should take into consideration that solar panels can be broken by tree branches or by objects carried by a strong wind. Generally, the solar panels are covered by a safety glass that helps protect the panels from damage … but if you are in an area where you are likely to experience roof damage due to falling / flying objects besides the obvious of making sure your solar installation is insured at replacement value, you should ask your solar consultant / advisor regarding susceptibility to such damage to make sure that you don't lose your power when you might need it most (i.e., such storms usually cause major blackouts that sometimes can take quite a while to fully restore power to everybody). The following is a list of the leading companies that produce and offer monocrystalline solar panels (we are in the process of building this database so please check back periodically. 1. Suntech Power is the worlds largest producer of crystalline solar panels, with more than 10 million PV panels sold in over 80 different companies. To learn more about Suntech Power, click here. 2. 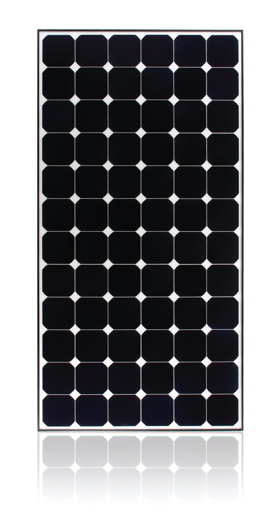 SunPower produces the most efficient monocrystalline solar panels available. They also offer all black panels (no visible metal strips), inverters and monitors. For more information click here. 3. Transform Solar produces a revolutionary new thin monocrystalline panel that is heat resistant, even produces in conditions of partial shading, and is highly reliable. It also uses just a fraction of the silicon to produce the same high levels of efficiency. For more information click here. 4. JA Solar is the largest producer of monocrystalline and polycrystalline solar cells, which it sells to other solar module manufacturers. It also produces its own PV solar panels that it sells primarily in China through its own solar development company Yangzhou Engineering.